T&C Robinson Saddlers are members of ‘The Society Master Saddlers’ association (www.mastersaddlers.co.uk) and with over 85 years experience within the company specialising in the finest English Saddlery, you can be sure that at T&C Robinson’s you will receive expert advice and a quality product. Our resident saddler, John Robinson, who is a qualified saddler and qualified saddle fitter, tends to visit the Lincolnshire area only, but may travel a little further upon request. Please check with us to see if your area fits within his range. We have a large selection of both New Leather and Synthetic saddles as well as a range of second hand. We stock new saddles by: Albion, Farrington’s, Jeffries, Ideal, Bates, Wintec, Monarch, GFS, Paul Jones, Kent & Masters, Fairfax, Thorowgood, Saddle Company. There’s plenty of choice for him to bring out to show you and for you to try. 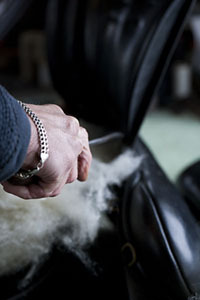 John can come out to your property/yard to check your horses current saddle fit and make any alterations if necessary. You may also bring your horse/pony to our Billinghay branch for fittings by appointment. John will take a template of your horses withers/back at your appointment so that he can check the correct width of your horse. This is all part of the service he gives. Please make sure your horse is clean and dry upon arrival. Using a Society of Master Saddlers’ Registered Qualified Saddle Fitter assures knowledgeable and professional service of the highest standard. The Society instituted and continues to operate and monitor the only professional saddle fitting qualification available worldwide. The qualification has been approved by the City & Guilds London Institute / NPTC, an internationally and UK government recognised awarding body. Your Society of Master Saddlers’ Qualified Saddle Fitter wants to provide a professional service based on knowledge and integrity. Purchasing a saddle involves considerable expenditure and some important decisions. The saddle fitter is there to provide expertise, advice, help and information. By using a Society saddle fitter you are assured of the support of the Society in the unlikely event that you experience any problems with your new saddle.